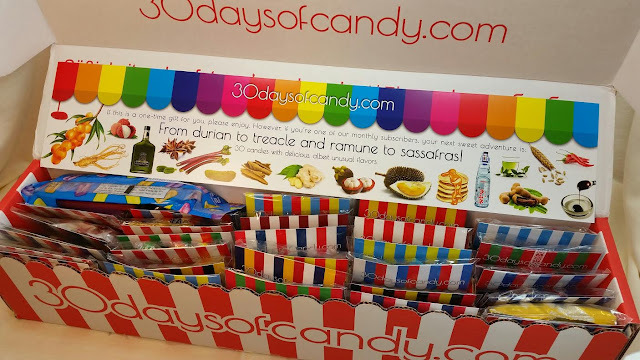 30 Days of Candy has to be one of the most fun candy boxes ever. This is not just candy, it's an adventure. I can think of a million reasons to get this box both for fun, adventure and learning. What an opportunity to teach something with incentive! 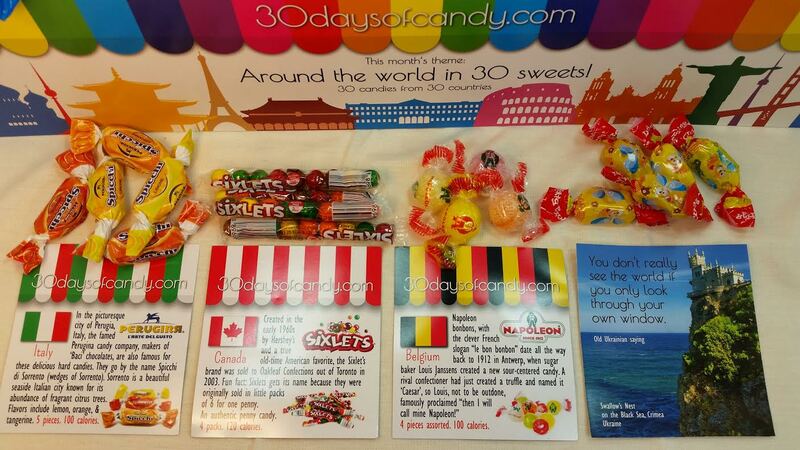 Each 30 Days of Candy box has 30 packets of 100 or so calories worth of candies. 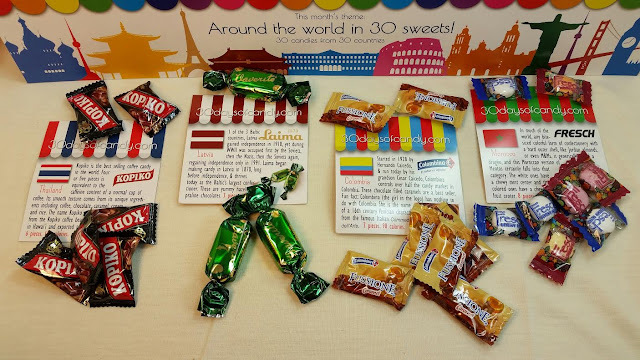 In this specific box, the theme is "Around the World in 30 Days." If you start a subscription, you will begin with this box. And it is a wonderful box, if I do say so myself. It arrives in a very long box. With it's red and white stripes, you'll know what it is for sure. This is not going to fit in a mailbox so it will likely land on your doorstep. The Cost: $29.95/month plus $5.95 shipping. What You Get: 30 Days of approximately 100 calories of candies from around the world with inserts explaining the candy, along with quotes and photos from the country of origin. 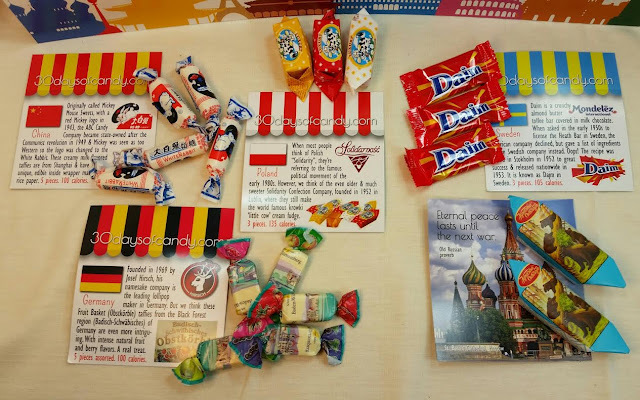 Austria- Pez candies and a bonus dispenser from Austria! Pez was originally a breathmint (the word Pez comes from the letters Pfefferminz, the German word for Peppermint) and was created in 1927. The dispensers came about in 1949 and designed like a cigarette lighter in order to encourage people to have a mint instead of a cigarette. Norway- Apparently Nords love their licorice intense and dark. The included licorices are a middle ground- soft with a strong licorice flavor. It seems a little salty, too. I love licorice (give me all the black jelly beans at Easter) so I tasted it. It is soft, somewhat grainy but deliciously licorice-y. Also, each information card included has a photo of the country on the back along with a quote or saying from the country. Norway's is: "A small but excellent party, said the man, drinking alone." Turkey- While Haribo invented gummy bears in Germany, most of the Haribo products are produced in Turkey. Haribo is the largest gummy candy manufacturer in the world. And I'm not surprised because they're delicious. USA- While I feel like Bit-o-Honey is an odd choice for an American snack, it has been around for a long time (over 90 years). I used to eat these as a kid but haven't had one in ages. Now is the time! Indonesia- Milkita is the number one candy sold in Indonesia. We don't really have milk as a flavor here in the states but in Asia it's quite popular. These aren't my favorite because I'm not a fan of the milk flavor. I've tried a few milk flavored candies but haven't been a fan of any of them. They're super popular, though, and show up in a lot of snack subscriptions. France- Jordan almonds! These are one of the oldest candies in the world, dating back nearly 1,000 years! Jordan is the mangled French for garden (jardin) because the almonds used were cultivated not wild. Yum! I love these so much. 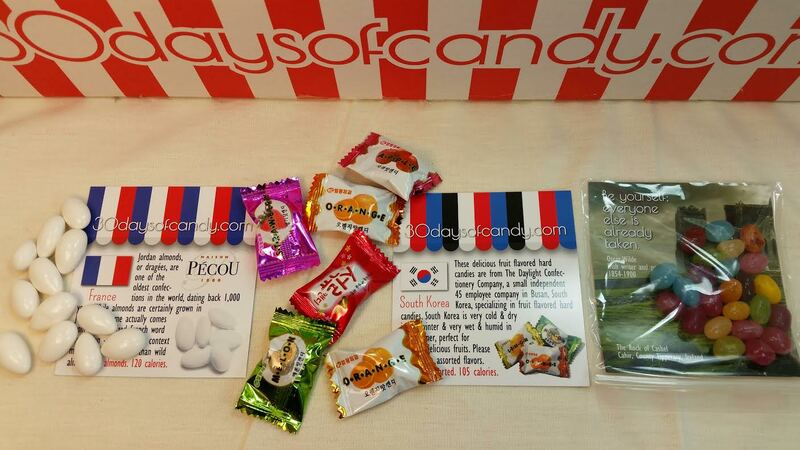 South Korea- These candies are from a small company in Busan, South Korea called The Daylight Confectionery Company. 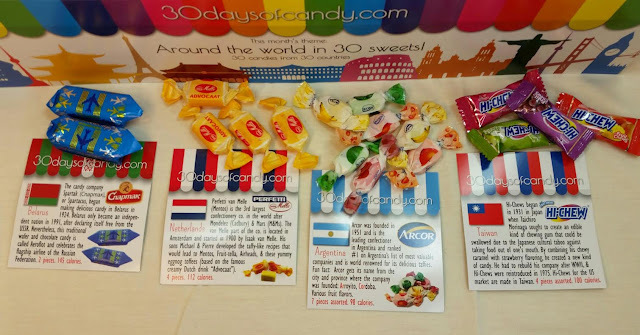 The hard candies are made from assorted fruits. I haven't tried these yet but I'm going to start with the Apple. Ireland- These jelly beans are from The Jelly Bean Factory in Ireland. They're all natural, use no artificial colors and are fair trade. They're also GMO, fat, gluten and gelatin free! If I hadn't just eaten all the Jordan almonds, I'd be eating these! China- These are White Rabbit milk flavored taffies with an edible rice paper wrapper. They're made by state-owned ABC Candy Company and are made in Shanghai. Poland- Fudge! Poland's Solidarity Confections has been making candy since 1952 and these "little cow" fudge candies are famous. Sweden- I love Daim. These are like Heath bars only better. They're made by Mondelez International in Stockholm. Germany- Hirsch is famous for their lollipops but the Fruit Basket Taffies have intense natural fruit flavors and are just as delicious. Russia- These almond praline wafers are called Mishka Kosolapy (clumsy bear). Belarus- From Belarus, there are wafer and chocolate candies called Aeroflot made by Spartak. Spartak has been making candy for almost 100 years! Netherlands- Based in Amsterdam, Perfetti van Melle developed Mentos, Airheads and these eggnog toffees based on a Dutch drink called Advocaat. I'm not a big fan of eggnog but I'll try them. Argentina- The Arcor candy company is Argentina's most valuable companies. They make fruit flavored taffies that are delicious. And there's a banana flavor!! (I like bananas). Taiwan- Hi-Chew are one of my favorite Asian candies. These are originally from Japan but the Hi-Chews you can get in the US are made at the candy factory in Taiwan. Thailand- Ah! I love these!! Kopiko is a coffee candy and is made with coffee, caramel and chocolate. I first encountered these in Croatia and they are very coffee-tasting and even have caffeine. Latvia- Laima is one of the Baltic's largest confectioners and they've been making candy since 1870. They probably know what they're doing. These are Hazelnut and Praline Chocolates. Colombia- From Columbia, we have chocolate filled caramels by Columbina, a company started in 1928 that controls about half the candy market in Colombia. Morocco- Fresch is the Moroccan version of Mentos! I love Mentos so I'm sure I'll like these, too. There are mint and fruit flavors included. Italy- Made in Perugia, these hard candies are called Spicchi di Sorrento and are flavored in the citrus Sorrento is famous for. There are lemon, tangerine and orange flavors. Canada- Sixlets! These used to be American but a Toronto company bought them. When Sixlets were originally introduced they were 1 penny for six candies. Belgium- Belgium may be famous for beer, chocolate and waffles but they also have some tasty hard candies. These Napoleans have sour centers and come in several flavors. Ukraine- Roshen is a candy company started by Petro Poroshenko. Yep, the same guy voted in as President in 2014. Poor guy. I don't envy him his job at all right now. I love Ukraine and I want them to have their autonomy. They deserve it after so much oppression. Anyway, these are treats with a stiff gummy exterior and jelly center. There are a whole bunch of flavors, too. Can't wait to try them. 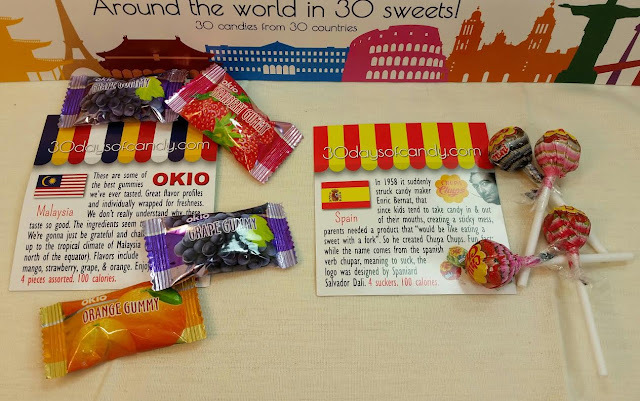 Malaysia- Oiko of Malaysia makes some legit gummies. I know because I just ate one. They are very flavorful which sometimes gets lost in some gummy brands. I need to find a bigger bag of these. Spain- I had no idea Chupa Chups were from Spain! And who knew Salvador Dali designed the logo?! Not me! Finland- These are Fazer Marianne mints. The blue ones have caramel in the middle and the red ones have chocolate. Singapore- Meiji is a famous Japanese confectionery. These cookies are the Hello Panda chocolate creme filled kind. There are 24 different sports playing pandas that you can find. Though these are a Japanese candy originally, the Hello Panda cookies made for export are manufactured in Singapore. England- My husband's name is Walker so we are quite familiar with these candies (and the shortbread, and the whiskey and the tv show). I think they're delicious! 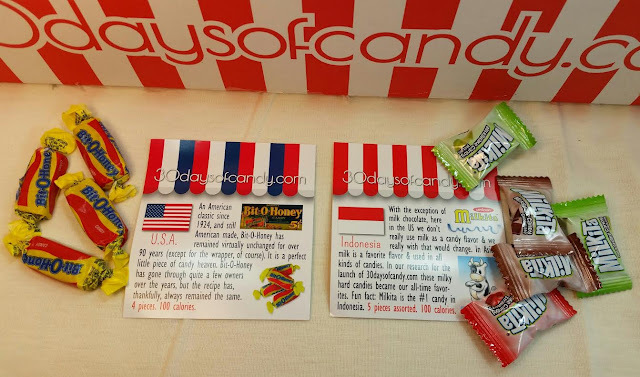 These were the first candies I ate after I opened the box and looked at everything. These are made by toffee specialists Walkers' Nonsuch. This was such a great experience. 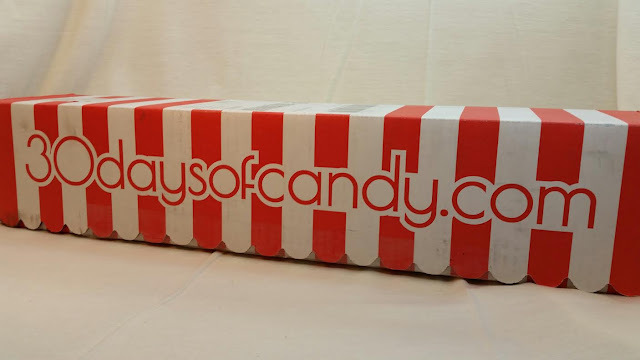 I know that seems kind of funny to say about a subscription box but this candy box blew me away. If you would like to sign up for 30 Days of Candy, your first box will be this exact one. Subsequent boxes will have different themes but will arrive in a particular order. 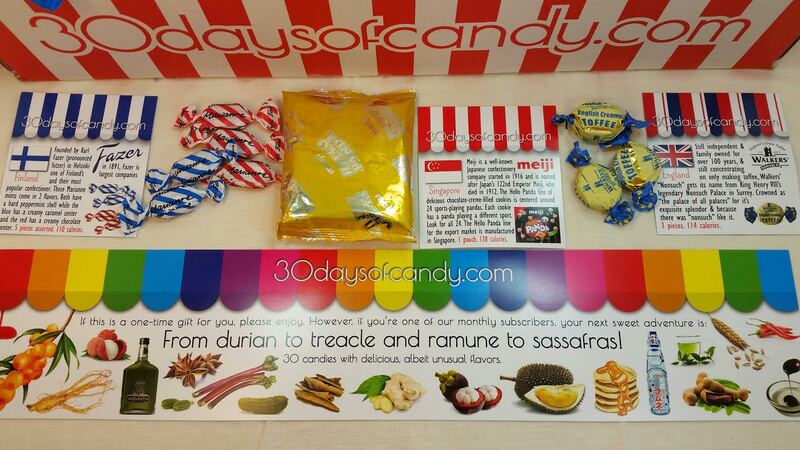 Your second box will be 30 Days of Delicious albeit Unusual Flavors. Sign up here and use code 30%OFF and get 30% off your first box! The novelty alone of this box makes it worth trying. *This box was sent to me for review purposes. All opinions are mine. I think this is a ridiculously awesome subscription. I am SO happy with everything about this candy subscription! I had read a review previously that seemed to indicate this was targeted to a child, but I'd just like to say " No way is this just for kids". First of all, how cute is that circus tent box waiting by your front door? Adorable and fun, right off the bat, not even opened up. Next, Sarah's so right about how nicely the candy is packaged. I've tried 3 bags of mine and am going to be surprised instead of reading all of her review as we started our subscriptions a few days apart, but this is a candy lover's dream. It would be appropriate for anyone from school age to retirement home. In fact, it would be a SUPER original pick me up for someone who might need a little extra candy sunshine in their lives. ( If we can have liquid sunshine, then we can have candy sunshine). The cards in each pack are not at all childish. They are so pretty and the quotations on them are so lovely that I'm saving mine. The flip side tells about the candy and its country of origin and so forth, so again, NOT childish at all. Just fun and very delicious. I am very happy that there's a portion which is around 100 calories because this is a sensible amount of a sugary treat to eat at one time. There's nothing I don't like about 30 Days of Candy, except maybe for the months which have 31 days. 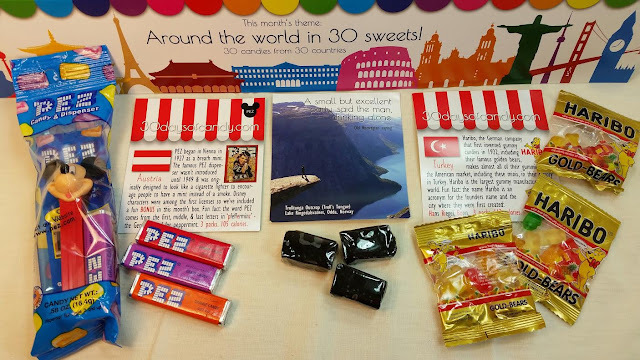 :) Just joking, but I am really impressed by the amount of creativity, artistry and great candy from all over the world. I would actually drop a subscription to keep this one if money was a factor. It's that good. Thank you, Sarah, for encouraging me to get the box. The discount for the first month is a really " sweet' deal, too.